This month's Employee Spotlight dons a friendly, welcoming smile all day long, every day. You'll be greeted by her if you visit our Ogden office, and for those who have already met her, I think they'll agree that they enjoy being greeted by such cheerful consideration. 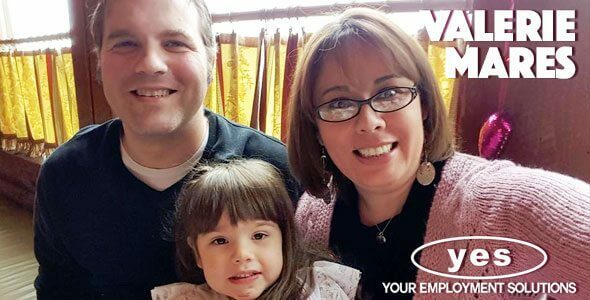 Valerie is such a fun member of our team and she not only provides support for the employees at her current work location, but she has proven to be very effective in helping other departments as well. Our HR department praises her often for helping find and correct minor payroll errors in a timely and positive manner, helping ensure the employees leave with an accurate check and a smile on their face. 1) Spending time with my family especially my daughter she is my life she makes me so happy. 4) Watching movies and tv shows. 1) Not enough time in the world. 3) Don’t like being so far away from my mom. Tough one. My supervisors Drea, Reed, Kerry, and yes last but not least Jarum. My coworkers, and talking to those who come into our YES doors. Honestly this company cares about their employees. I feel like I never left my previous job. Hhhhhmmm don’t tell my honey, but I’m sure he knows this answer John Cena or the whole 49er team! Texas! Miss my home state! 7. You just graduated with a degree in behavioral science! Congratulations! Why did you choose to major in that and what ideally do you hope to do with your degree? I found my calling when I started working as a Program Assistant for Information and Referral for Fort Bliss Army Community Service. I met and came across so many people that I talked and listened too. Working there I was making a difference in our military community especially our civilian community. Right there and then I told myself I need to go back to school after 12 years and get my degree. With the love, push and support of my family, friends and especially co-workers I decided to make the right choice and go back. If I can do it, anyone can. Just as long as you put your heart and soul into it. What I hope to do with my degree field… well I can say I am doing it right now helping out people. I'd love to be a case/social worker and help out my community in any way, shape, or form. I will be continuing my education pursuing my Masters come October. Good question. Not being able to help every single person. Going above and beyond, just listening more to what people need and are looking for. This is the best place to look for a job or even make a career move. 11. You’re a big fan of the Walking Dead. Who would go first on the zombie apocalypse. The president of Your Employment Solutions Reed Laws, or the vide president Kerry Westenskow? Why? Yikes! I can't choose! They're both so awesome. I think I would go first because I am so out of shape.. lol! If I had to choose… sorry, Reed please don’t take a bite out of me! Go after Kerry first, lol! Thanks Valerie for all that you do! We are thankful to have you as part of the YES Utah staffing team!